Click for your FREE ideal-LIVING Relocation Package! Looking for a Vacation that Will Change Your Life? Choose the Tellico Village Discovery Tour. Enjoy a three-day, two-night to discover the East Tennessee Mountains & Lakes.”Come and discover why it is better in Tellico Village.” Visit Tellico Village and experience the beauty of East Tennessee & Tellico Lake. Choose from onsite or offsite accommodations. When is the earliest you can tour? The latest you can tour? By submitting this form, you agree to allow Ideal-Living.com to provide your contact information to the selected communities. We invite you to Discover East Tennessee Mountains & Lakes. * package is based on current offering, seasonal rates may affect final pricing. Please contact the Tellico Village staff for details. Package only available for first time visitors and guest of Tellico Village. Offered on a first come, first served basis, limited availability. Restrictions may apply. Subject to change without notice. This is not intended to be and does not constitute an offer in any state or jurisdiction where prohibited by law. Equal Housing Opportunity. The only way to appreciate ALL that Tellico Village has to offer is to experience it for yourself. Schedule your visit by booking a Discovery Package with us. Seasonal rates and special opportunities are available on a first-come basis. 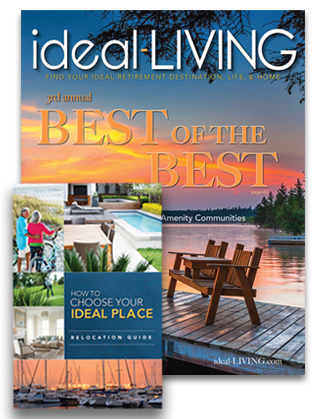 © 2019 ideal-LIVING Magazine • 265 Racine Dr #201 • Wilmington, NC 28403 • 910.763.2100 • DMCA • Advertise with us!